The Oregon Handball Assoc is proud to report the new pact between the WPH and Hood River Handball, forming a new Jr WPH team at Horizon Christian School in Hood River, OR. This new Jr WPH Hood River class has two dozen Jr players between 7th and 12th grade at the small private school, with half the class attending bi weekly morning lessons and the other half attending bi-weekly afternoon lessons. 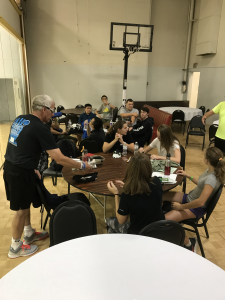 Science teacher and Stenberg family patriarch Oscar Stenberg leads the classes, assisted by fellow science teacher Jim Brown and local player Ron Harder, as well as other members of the Stenberg family and other members of the Hood River handball community. The first set of classes were held on September 14th at the Hood River Elks Lodge, with instructors Oscar Stenberg, Jim Brown, Ron Harder, and Helen Stenberg leading the classes, with Pat Harford and Jennifer Hinman assisting the afternoon class. Both the morning and afternoon classes had 11 players each in attendance and that number is expected to grow as the class continues. The WPH Foundation was instrumental in establishing the program, providing dozens of gloves, goggles, and handballs for the new team. 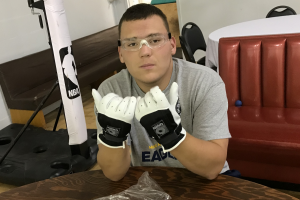 “Oscar contacted me wondering where he could obtain handball gear for his students” explained Oregon Handball Chairman Nick Flores. 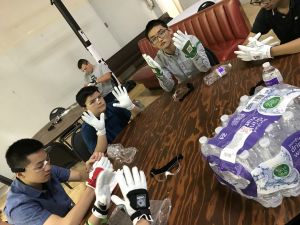 “I contacted the WPH immediately, and within a few days all the necessary handball gear was delivered directly to Oscar’s doorstep.” The WPH also provided their valuable curriculum to the Hood River coaches to help get the program started. Students in the Junior WPH Hood River program are learning proper form and swing mechanics, and basic concepts and strategies of the game, as well as character traits that are essential for handball such as teamwork and integrity. Additionally, the program will have an ongoing goal of tournament participation for its students, and the students will be able to play in local tournaments at no cost thanks to the generosity of the Alten Handball Foundation. A concerted effort will be made to include Junior WPH Hood River students at the 2019 Oregon State Singles Championship to play against students from Sheldon High School in Eugene, as well as other local high schools. If you would like to support the effort, get involved, or learn more about Junior WPH Hood River or the Hood River Handball Association, please contact the HRHA at hoodriverha@gmail.com.